Rosney Daniel, MD, an R2 and UCSF MD program alum, and Daniel Lowenstein, MD (third and fourth from back row), co-facilitate a small group session on diversity, inclusion and bias. For new student orientation, I joined my first-year classmates on the Mission Bay campus for an intensive boot camp on the most widely applicable clinical procedure we will use as doctors: communication. 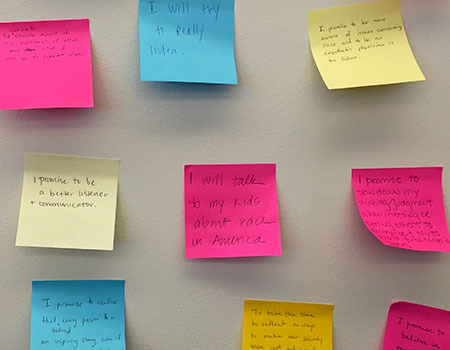 Dozens of faculty and staff members led the incoming class in a newly expanded diversity, bias, and inclusion training, which was developed in response to the past year’s events at UCSF and beyond. The deaths of Eric Garner and Michael Brown, among many others, at the hands of non-indicted police officers, have led to a surge of activism and awareness about racial inequality at all levels. This consciousness has led many to call for change in how black people and other disadvantaged populations are treated in health and healthcare by foregrounding issues ranging from microaggressions to community health disparities. Dean Talmadge King, Jr., MD, welcomed us into the school with a delightful speech about his life and advice for medical students. He quoted Maya Angelou’s famous line, “I’ve learned that people will forget what you said, people will forget what you did, but people will never forget how you made them feel.” I found myself thinking back to these words of wisdom during orientation, as it concisely sums up many of the communication skills we learned and practiced. Catherine Lucey, MD, vice dean for education, gave an inspiring and memorable speech about being an intern at UCSF at the start of the HIV/AIDS epidemic in the 1980s. Lucey recounted how UCSF mounted a coordinated and multi-pronged attack against this devastating epidemic to discover the causative agent, treatment and prevention options, and a cure. While the fight against HIV and AIDS is not over, another affliction to people’s health has reached crisis levels: health inequities. 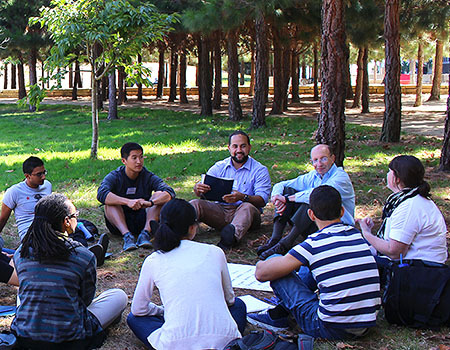 Eliminating health inequities is the calling for our generation of UCSF physicians. Out of the conversations that followed the deaths of Garner and Brown, UCSF medical students founded a national organization, White Coats for Black Lives (WC4BL), and organized a “die-in” at medical schools across the country to raise awareness about health inequities, especially across racial lines. As a featured speaker, third-year medical student and WC4BL co-founder Sidra Bonner explained the importance of the subjective in the SOAP (subjective, objective, assessment, and plan) note, the basic format of a doctor’s written notes about an encounter with a patient. Typically, the subjective is the patient’s subjective account of his or her symptoms—the chief complaint. Bonner turned that idea upside down and placed the subjective role on the clinician to avoid bias and intolerance while communicating with the patient. The O, A, and P will be useless and even detrimental to the patient if the S is distorted by prejudice. For several hours each day, over 150 students separated into groups of seven or eight to practice the communication methods and have the opportunity to give and receive constructive feedback—another critically important skill we will use in medical school. On the second day, the class watched a staged microaggression between two faculty members. The conversation was painful and awkward; we split up into our small groups to discuss what we had just witnessed. In my group, we pinpointed exactly which words and sentences used showed bias and why and discussed how a bystander to this conversation might interject appropriately. Students share their take-away lessons from orientation. New Student Orientation from UCSF School of Medicine on Vimeo. Our reporter-at-large, Zoe Kornberg, is a first-year medical student at UC San Francisco.